While their original use was to cover the head, in the time of ancient Greece and Rome, handkerchiefs were by then used in the same way they are today. 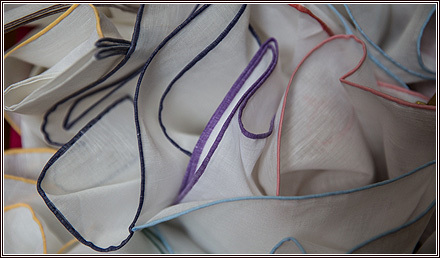 People in Europe began to carry kerchiefs in their pockets to wipe their forehead or their nose. To distinguish this kind of kerchief from the one used to cover the head, the word hand was added to kerchief. In recent years their use has become far more prominent. It’s often said you should have ‘One for show, and one to blow’. 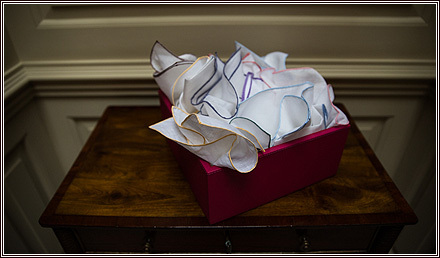 With this in mind, at both the Bespoke shop and the Haberdashery we have a handkerchief for every occasion – made from silk and linen to cotton and cashmere.